Fainting goat breeder producing Champions year after year. Our herd has tested negative for CAE, CL and Johnes. We tested the entire herd in 2010, 2011 and 2012! Since then, we test intermittently and all results have been negative. We believe a healthy herd is the basis for a quality herd. We truly love our Myotonics! They are easy keepers and very hardy. They make great pets, excellent lawnmowers/ weedeaters and are always there to give us a good laugh! We are members of the MGR and also participate in the FGG functions. Myotonic Goats are a wonderful breed that we believe needs to be preserved. We hope you enjoy our site and we look forward to hearing from you. Myotonic goats as a breed are said to have originated in Tennessee. We now have Tennessee strains, Texas strains and minis. Although ALL are the same breed and still come from the same initial stock. Myotonics range in size from 17-30+ in. at the withers. Some are even larger although we prefer ours to be under 30 in. As the goats grow beyond 29-30+ inches at the withers you really lose the easy gain on browse trait that is sought after in this breed. They come in all colors and hair lengths and can be horned, polled or disbudded. Some breed characteristics that apply or should apply to all Myotonic goats are their somewhat bug eyed appearance, they also have a prominent stop below their eyes. They should have a somewhat stocky appearance, although too wide is considered a fault since it can impede their adaptability to all terrain. The Tennessee Fainting Goat is in the meat goat category. Known for high meat to bone ratio,as their myotonia tends to increase muscle tone. 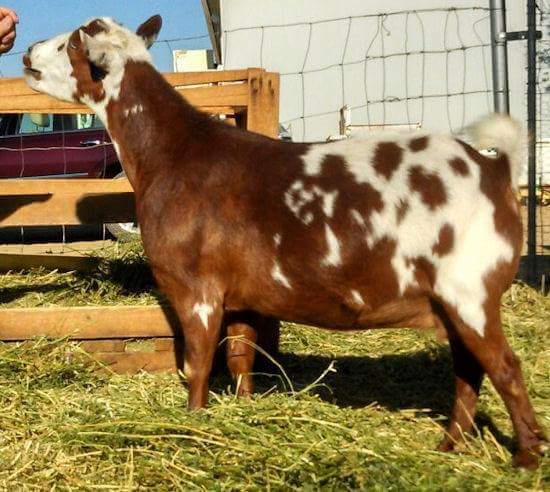 This medium sized goat is easy to raise, exhibits qualities such as excellent mothering skills, easy gain on browse (no concentrates) and high parasite resistance. We breed specifically for strong legs, hooves and high parasite resistance. Some of our stock are over 10 years old and have rarely needed their hooves to be trimmed and have never needed to be wormed. Fainting goats are listed in the American Livestock Breed Conservancy's Conservation Priority List. It is important to preserve this rare breed, and easy to do so, given the fainting goat's fit to most of America's climate. They definitely thrive where other meat goats fail to deal with the damp, sometimes cold hills of Tennessee and similar temperate areas. Though myotonic behavior is seen as a novelty, the breed is so much more than a comedy act. The Myotonic goats are calm, easily trained and make wonderful pets. On our ranch they seem to think they are dogs instead of goats. We always have a goat following us around the property trying to "help" with farm chores.